It is vital that any piece of sponsored content, from a blog post to a tweet to an Instagram photo, sufficiently discloses that is sponsored. 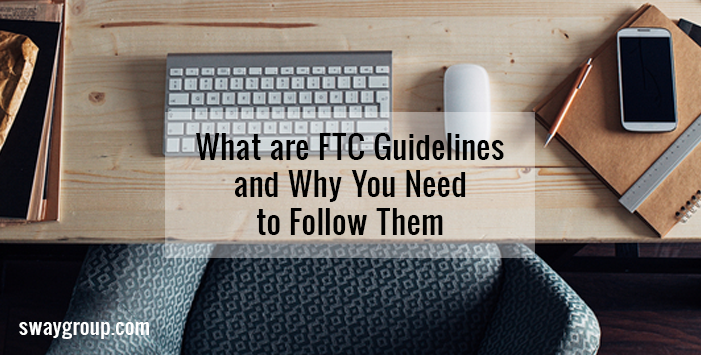 Following FTC guidelines for sponsored content isn’t complicated – simply follow the rules below. The Federal Trade Commission (FTC) has new guidelines for sponsored content that outline how influencers must disclose when they are being compensated by brands. This comes hot on the heels of the settlement of their high profile case against Lord & Taylor, accused of hiring 50 influencers to post about their product on Instagram without disclosure. And even more recently, L’Oreal and Warner Bros were outed for hiring online influencers to share sponsored content without proper disclosure. In each case, influencers were not required to clearly state that the content they were sharing with their audience was paid for. And that’s a huge no-no. Many experts believe these latest actions by the FTC are just the beginning of the commission’s moves to more aggressively enforce their new sponsored content guidelines and stay on top of the rapidly growing world of influencer marketing. The FTC is sending the message that more enforcement actions are on the way for any influencer campaigns that are not clearly identified as sponsored content. At Sway, we’ve taken the FTC guidelines for sponsored content seriously from day one and carefully ensure that all of our influencers follow them on every campaign. Unlike some networks that handle compliance via software, we believe that compliance is best ensured by human beings. We have a robust Quality Assurance (QA) team in place whose job it is to check every piece of content within 24 hours of it going live (and prior to go live for campaigns with post approval built in). It is vital that any piece of sponsored content, from a blog post to a tweet to an Instagram photo, sufficiently discloses that is sponsored. In posts on every social media network and blog, the disclosure must come before there are any links to the brand’s website or other brand content – including sponsored posts on the influencer’s site – so that readers are aware before they click through. While the FTC doesn’t mandate specific wording of disclosures, the fact that an influencer has been paid must be clear in each post. On social media, using the word “AD” “#AD” “AD:” or “Sponsored” is sufficient, which is why we require our influencers to include “AD” in every social media post. On blog posts the disclosure must be clear as well. We encourage influencers to incorporate an organic statement into the first paragraph of their post to inform their audience that it is sponsored content, while still encouraging them to read on along with clear disclosure at the bottom as well. What doesn’t fly as a disclosure? The use of “#sp”, “#spon”, “#paid”, etc. If it doesn’t make sense to a lay consumer that it’s sponsored content, it does not meet FTC guidelines. Also, “#collaboration” and “#partnership” will also likely fail to meet the required level of disclosure for the same reason. Regulated industries must take special care with disclosures and content to ensure it follows their own industry-specific regulations in addition to FTC guidelines. For instance, companies within the pharmaceutical industry may need to add additional disclosures to inform consumers about the acceptable use and benefits of their products. We work closely with our clients in these industries to craft special disclosures and provide guidance for influencers as they create content. Our QA team carefully inspects this content prior to go live to ensure full compliance. Let’s Make Your Next Influencer Campaign a Success! If you are interested in working with influencers, let us help you stay within FTC and industry guidelines while producing creative, engaging content that reaches your target audience. Tell us what you’re looking for and we’ll find the right match for your brand.